Laissez-nous vous aider à planifier vos prochaines vacances magiques à Windsor Hills, à seulement 2 miles de Disney, avec un large éventail d'équipements pour les familles, c'est le choix idéal pour s'amuser en famille! Votre magique Disney Getaway offre un emplacement idéal avec un balcon ouest donnant sur les courts de tennis, de sorte que vous et votre famille peut profiter du soleil de Floride. Avec 1408 pieds carrés de luxe salon, cette maison de vacances dispose de 3 chambres et deux salles de bains. Style traditionnel, avec un peu d'un style contemporain, et une riche palette de couleurs donne le ton pour une aventure loin de votre routine quotidienne. Le salon est doté d'une télévision à écran plat et d'un lecteur DVD pour regarder des films ou des émissions télévisées populaires. Il ya aussi une Sony PlayStation 3 pour l'utiliser comme un lecteur Blu-ray. De nombreux sièges permet à la famille de se rassembler autour de la conversation dans le salon ou un jeu de cartes à la table de salle à manger. Vous pourrez profiter du temps chaud sur le balcon, qui peut être accessible depuis le salon. Après avoir manqué l'appétit en vous promenant dans les parcs d'attractions, chacun appréciera la cuisine complète équipée d'un four micro-ondes intégré. La cuisine est fourni avec la batterie de cuisine et la vaisselle nécessaire. La somptueuse chambre principale est meublée avec un magnifique lit king size et une télévision à écran LCD. La deuxième chambre est équipée d'un lit queen et dispose également d'une télévision à écran LCD. La troisième chambre ravira les plus jeunes (et les plus jeunes de cœur) avec son merveilleux téléviseur LCD mural. Clean. Spacious. Great pool and play area for kids. We will stay here again. Pros: Great spacious and clean unit; Great pool (heated! 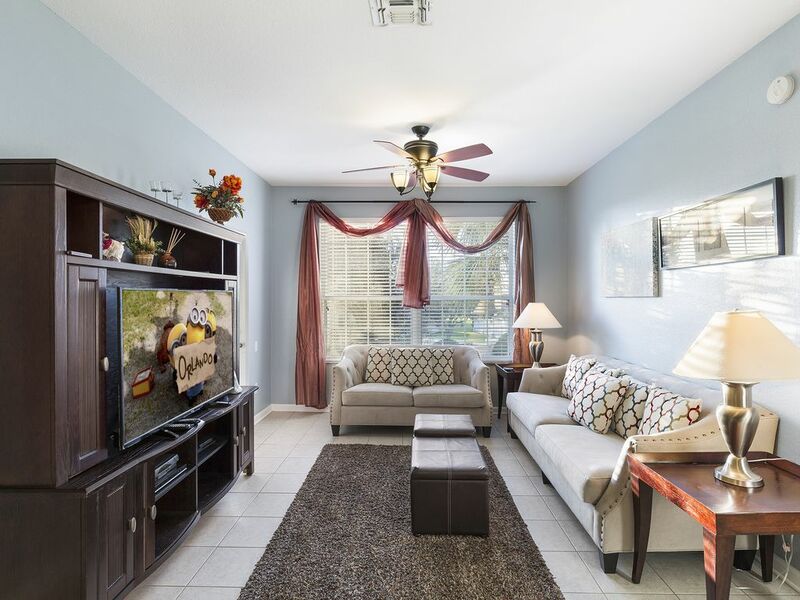 ); Clean and comfortable; cookware, dishes and cutlery provided; Plenty of fresh, standard sized bath towels but no specific beach/pool towels; Convenient location - close to grocery, the interstate & Disney parks especially. Did provide small packet of laundry soap and one packet of dishwasher soap. Cons: Disappointed to find out upon arrival that we were responsible for any/all paper products, specifically: extra toilet paper - there were only 2 half-rolls in the unit and no extra, paper towels and coffee filters; No shampoo or conditioner provided; Only one bar of soap provided. No basic cooking spices ( including salt and pepper). I wish we would have known we needed to buy these items prior to already going to the grocery store. Thank you for your review of your rental property! We appreciate all feedback from our guests and hope that you had a truly Magical stay making memories with your family! As self-catering stays, we are unable to provide spices or salt & pepper, however, all feedback is considered for the future. We hope to see you again soon! We had a fantastic stay at this condo. There was plenty of space for our family of 5 to be very comfortable. 10-15 minute drive to all Disney parks, and near a WalMart for groceries. Our kids loved the pool and waterslide area. Hello, Heidi! Thank you for staying with us! We are so pleased that you had a wonderful vacation and enjoyed your condo! Please keep us in mind for your next trip to Central Florida! Clean! Spacious! Felt like home! We headed to our next destination after staying at this condo for 5 days and were so sad to leave. Now we are crammed into a tiny hotel room. We truly loved our stay! Unit was fine but, for what we paid, never again. Minimal paper products, toilet malfunction in master bath, no instructions on how to use tv/cable system which wouldn't turn on the last day. Issues which were responded to---no teaspoons, no functioning can opener, vacuum cleaner was filthy and barely worked, no light bulbs to read from at night (not solved during our stay), no instructions indicating locking system key pad had to be used when leaving unit and only upon entering, instructions for bedroom clock time setting not given, only one oven setting with no instructions for others, no dishwasher soap, security gate card usage was very difficult--not user friendly. Pool was great and perfect temperature. But we will never go there again. James, thank you for taking the time to provide us with such detailed feedback on your stay. We will look into the possibility of providing instructions on the various items that you mentioned in order to make the unit more user friendly. We are happy to hear that you enjoyed the Windsor Hills Resort and the accompanying amenities. We had a wonderful week at this location! Everything you need in a kitchen is there! The kids just loved their room and the adults did as well! We felt very comfortable and very safe. I would recommend this place for anyone travelling and wanting to go to Disney. Walmart is very close so when you need anything, you can simply drive 3 minutes and everything is there... plus restaurants, gift shops, etc! The condo was clean and well equipped. We did have a problem with the garbage disposal that was fixed promptly. The tv in the kids room never was fixed as they had to order a part. Would have been fun to have it working for the kids. The ceiling fan in the master didn’t work and because the thermostat was set so you couldn’t make it colder, it was rather hot in that bedroom. They did have a box fan, and that somewhat helped. The only other complaint was that the people directly below us smoked, and we couldn’t sit out on the balcony, especially with the grandchildren because the smoke rising was horrible. The condo itself was clean and fit our needs perfectly and for a very good price. Marsha, thank you for taking the time to leave feedback on your stay. We are glad that you enjoyed your time at the Windsor Hills Resort. We apologize that we were not able to expedite the part for the television to arrive during your visit. However, we are happy to hear that we managed to rectify the other items quickly. We are also happy to hear that you found the condo clean and well equipped. We hope to see you in the Orlando area again soon. Si vous avez l'intention de se rendre à Orlando, en Floride, la maison de Walt Disney World, et que vous cherchez à louer une maison de vacances magnifique à un bon prix, alors Windsor Hills Resort est l'endroit pour vous! Le complexe est situé à Kissimmee, en Floride, à seulement 2 miles de l'entrée de Disney World! Windsor Hills dispose de toutes les commodités d'une station haut de gamme jumelé avec le confort, la commodité et intimité d'une maison haut de gamme, à seulement une fraction du coût! La sécurité gated Windsor Hills de vous et de la sécurité de votre famille se assurer, de sorte que vous pouvez avoir la paix d'esprit sur vos vacances. Avec l'incroyable situation, vous aurez accès à des équipements fabuleux disponibles à Windsor Hills!